We're still buried in snow here in Canada, so this is a bit of a daydream post. I would most definitely be wearing this on a casual Sunday, were it not for Old Man Winter and his cronies. I have to say, this boyfriend button-down from The Gap has ended up being one of my favourite pieces ever. It's soft and slouchy but is proper enough that I can sneak it into my work-wear rotation as well. Are you sick of these sandals yet? I have to admit I am a little bit. They're wonderful and required zero breaking-in time, but they're still my only pair. I'm tired of looking at them. Perhaps I'll be singing a different tune once it's actually summer here, but for now I've happily tossed them into my box of summer clothes. p.s. 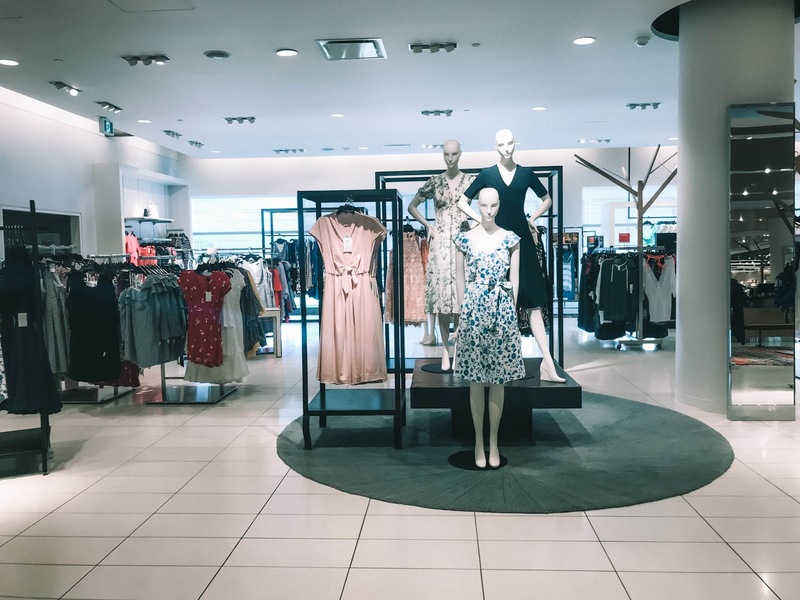 I've been bad (again) and have done some more fashion shopping. 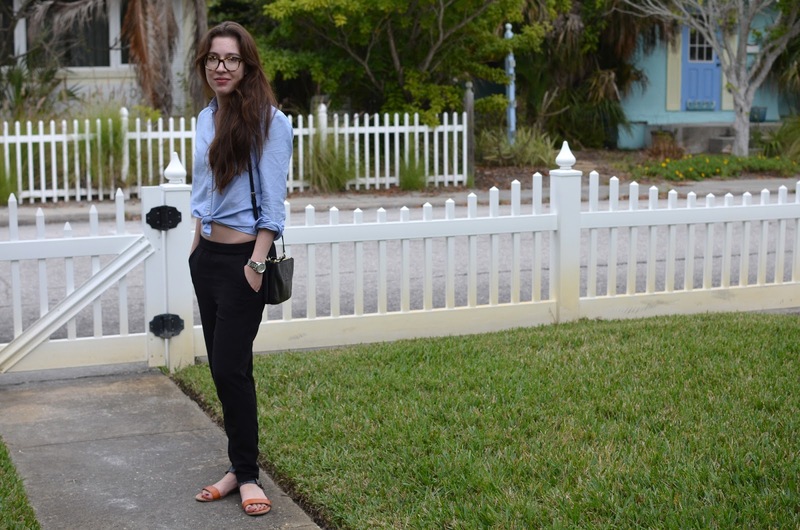 I still have some Florida OOTD posts to put up, but I have a feeling I'll have some snow-backgrounded (is that a word?) shots soon too! I feel like I've fallen into a face/base/foundation rut, but it's one of those ruts that really isn't all that bad and could be infinitely worse. Inevitably I will end up trying something my face hates, thus sparking a breakout or two... I can't help myself sometimes. But until then, I'll sit here happily with my Chantecaille Just Skin and my Makeup Forever Face & Body foundation, thank you very much. 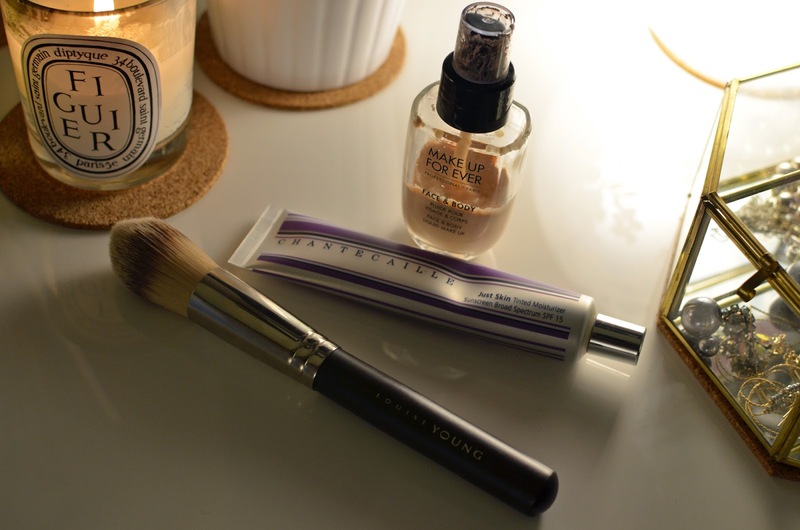 The newest part of my routine - and not by much, since my Just Skin is pretty recent too - is this foundation brush by Louise Young. I'd read numerous raves about it on primarily UK blogs, and my interest was piqued. Louise Young isn't available in Canada, so once I had decided to bite the bullet, I held my breath and ordered this through Beauty Bay, which *ahem* doesn't have the best reputation in terms of customer service. Happily, my order did not mysteriously disappear in-transit and I am now the proud owner of the Louise Young LY34 Super Foundation Brush. Holy moly is this thing ever enormous. It's huuuuuge. And it takes about half the time to get my foundation over and done with, because ain't nobody got time for that. Granted, I've only really used it with these two foundations, both of which are very light coverage. Foundation for people with pretty decent skin, which happens to be me at this point in time (yaaaaaaaasssss), so I cannot really say one way or another how this fares with a thicker formula. My favourite thing about this monster-brush is that it does everything. It spreads foundation like a flat/paddle brush, and buffs it like a flat top brush. All in one brush. Perhaps this is a tad premature and dramatic, but this is akin to a makeup miracle in my books. If there is such thing as clothing detox, please point me in the right direction because I am quite certain I am addicted to this sweater. It's becoming a problem. Because ideally, I would wear it every day, however that's kind of gross and not the most exciting. But I just keep on reaching for it. Even in warmer weather, I was all over it. I can't be stopped. It feels like ages ago that I was down south in the sunshine, so it's a nice feeling to be writing about an outfit that's not essentially just a huge coat (although my leopard coat from Aritzia will be making an appearance on here soon!). I've had this mini skirt for ages, and it has turned out to be a fantastic Zara sale steal. 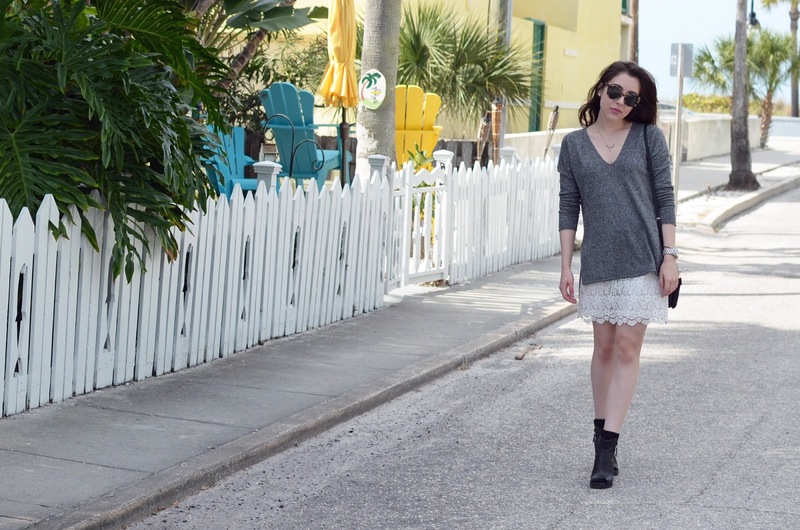 One of my favourite bloggers, Laura from Buynow/Bloglater, had purchased the skirt and shown it in an OOTD post. I wasn't crazy about it at that point, but when I saw it in store I figured I'd give it a go, since it was so deeply discounted by that point. Needless to say, it came home with me and has been well-loved! My accessories were pretty minimal for my whole trip, so you'll be seeing the same things quite often in these OOTD posts. While down in Sarasota, I purchased a beautiful necklace from Anthropologie with some Christmas money, and found that it pairs amazingly with my Tiffany & Co. Diamonds by the Yard pendant. I'm also wearing my rings from Victoire, a local boutique in Ottawa. These have pretty much been on my fingers since I bought them, so I'm declaring them as official "mainstays" of my collection. Something tells me I'll be repeating this outfit this summer (or more likely this spring) when the weather is hovering around 20C. I'm not sure what I'm going to do when it's too hot to wear my beloved sweater, but I guess I'll cross that bridge when I get to it. I suspect you've all noticed that my blog has a new look. I'd love to know what you all think - I adore it! It was time for a change (and an upgrade!) so I thought I would bite the bullet and buy a custom template on Etsy. The seller I bought from is here and she has loads of Blogger and Wordpress templates to choose from. Also top-notch tech support :) Highly recommend! Once my skin calmed down from the inevitable mess that comes after flying, I've found myself being able to string together multiple "good skin days" in a row. Meaning minimal base, a touch of concealer, and whatever eye/lip/cheek combo I'm feeling that day. This is rare for me, to say the least. Once I'm certain that this isn't a fluke, I'll share my most recent skincare routine and discoveries, but in fear of possibly jinxing my delightfully blemish-free face I will wait for further confirmation and reassurance. I will, however, share some of my current face base routine... which features something new and stupid expensive. 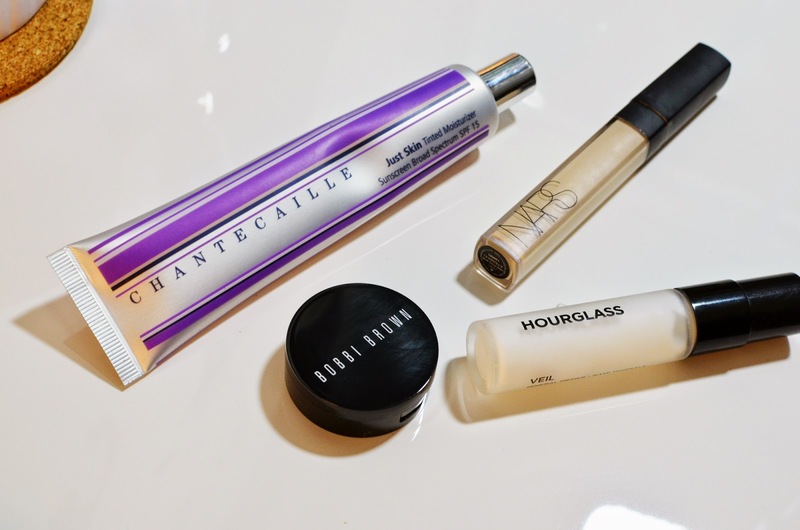 The other bits you've all seen before: Bobbi Brown corrector in porcelain bisque for my ridiculous undereye circles, NARS Radiant Creamy Concealer in the lightest shade, and my old faithful Hourglass Veil mineral primer. I keep going back to these products no matter how far I stray.